A venue-wide ban on a modernized Super Smash Bros. controller at a major tournament last weekend has re-heated the debate about what kind of controllers should be used in Super Smash Bros. Melee tournaments. At The Big House 7, which featured everything from Super Smash Bros. 64 to Super Smash Bros. for Wii U, controllers like the Smash Box, which seeks to improve the competitive Melee experience by forgoing the traditional (and functionally ancient) GameCube pad for a collection of arcade buttons, were not allowed. Robin “Juggleguy” Harn, head organizer for The Big House and part of the committee that’s tasked itself with establishing a universal Melee ruleset, said that banning box controllers was a no-brainer for competitive reasons. The precise inputs, he told Compete, give players too much of an advantage over those who use GameCube pad’s joystick. The biggest argument in support of such controllers is that these modern devices have given a second chance to players who can no longer utilize the console’s original controllers due to health issues, but the organizers behind the world’s most prolific Melee events have yet to come around. Banning the controller in their competitive brackets was one thing, but controversy flared when Harn and his staff made it clear that boxes weren’t allowed anywhere in the venue, even during casual matches that had no bearing on the official tournament. Harn would pin this on controller performance and event partner Nintendo. Reports of the ban arose after the event and led to a swirl of rumors and confusion. Late Wednesday night, a Big House volunteer named Liam “Jagerbombsoldier” Butler jumped on Reddit to share his story with the community. When he arrived for his opening day shift running brackets on the morning of October 6, Butler was told he would need to keep his new box controller in his bag. He reiterated these details in a separate conversation with Compete, adding that Harn and lead Melee organizer Alex “Shadez” Gamero told him it had to do with developer Nintendo’s involvement with the event. Shortly after Butler’s post went live on Reddit, this information was corroborated by two other sources. As the thread expanded, fellow tournament volunteer Sam “Wisely” Mihelich mentioned being told that box controllers had to be out of sight and that a lack of compliance could be met with expulsion from the event by security. Speaking to Compete, he added that these directives were shared with him by bracket coordinator Josh “Roboticphish” Kassel, not Harn or Gamero. When the news made its way to a Facebook group for the popular Melee It On Me podcast, another staff member named Jeremy Sonpar said he was also told that the devices were prohibited throughout the entire venue. Controller Legality: The only legal Melee controller is the wired Nintendo GameCube controller; all other controllers are banned, including the wavebird and Smash Box and its variants. Traditionally, these kinds of rules don’t apply to matches outside the official tournament bracket. Organizers typically let players do as they please in unofficial friendly matches. During our conversation, Harn confirmed that these guidelines were in place at The Big House, and seemed incredulous that attendees had assumed the rules on the tournament’s site were unique to competition and not applicable to all aspects of the event. The bit about utilizing security to remove noncompliant attendees, however, he equated to an out-of-control game of telephone, with different versions of the truth spreading so much that false information starts to be added to the truth. He claimed that he never directed anyone to act in such a way, but couldn’t say the same for the various levels of staff and volunteers that helped run the event. Harn blamed the quality of the new controllers for keeping them out of the event. There are currently two major box controllers vying for the attention of the Melee community—the Smash Box and the B0XX—and neither are known to have the widespread electrical issues Harn purports. The former is currently in development by HitBox, who have produced similar devices for the traditional fighting game community. 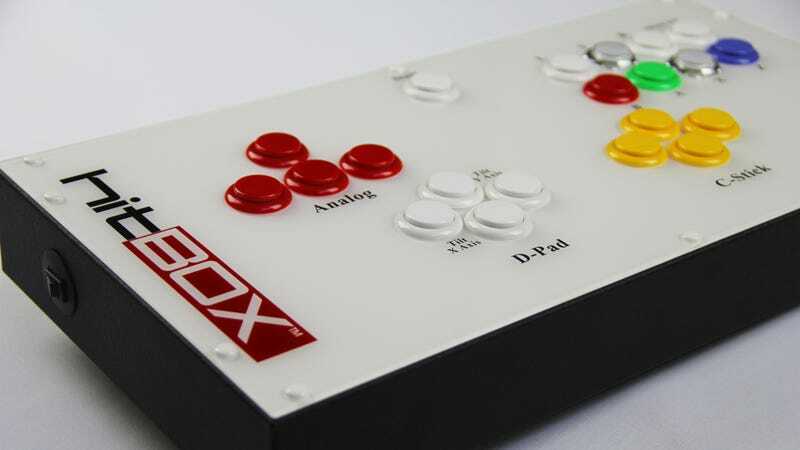 HitBox products have been legal in Street Fighter and Marvel vs. Capcom competition for years and, according to statements provided to Compete by co-founder Dustin Huffer, electrical issues like the ones Harn mentioned have never been reported for the 70-odd controllers that have been sent to alpha backers of the Smash Box crowdfunding campaign. I’ve also had a hard time finding corroborating reports online. That said, it’s Nintendo’s involvement with The Big House that may have made the biggest impact in universally banning box controllers. The developer’s logo was prominently displayed during the weekend’s broadcast, thanking them for partnering with the event. Because The Big House is an officially licensed event, Harn said, his tournament had to abide by certain “constraints,” though he was unable to divulge specifics. Harn said that he’s open to an ongoing dialogue about the legality of box controllers, but it became clear during our conversation that there’s a lot more behind their banning than was originally shared with the public. Nintendo has its rules and the cost of working with them is to follow them, it seems. What Nintendo provides these events, however, is unclear. Harn wouldn’t say. We reached out to Nintendo about all of this, but the company did not provide comment for this article. Without an open understanding of how Nintendo supports these events, there’s really no way for the rest of the community to have equal footing in such discussions, which can make trusting the handful of individuals who run the most important Super Smash Bros. tournaments tough. Parallels can (and have) been drawn between this latest controversy and the one that surrounded popular Super Smash Bros. Brawl mod Project M in its heyday. As an unofficial tweak of a licensed Nintendo product, Project M always existed in a weird gray area, and often found itself on the outs when it came to broadcasts at major competitions. In February 2015, prolific Smash producer Calvin “GimR” Lofton of VG Bootcamp explained that his channel would begin moving away from Project M streams following the release of Super Smash Bros. for Wii U to avoid complications that could endanger his business. Later that year, the Project M devs called it quits for much the same reason, foreseeing a future where Nintendo, as the rightful copyright holder, could come crashing down on the scene with disastrous consequences. Despite their continued passion, simply competing for the sake of competing hasn’t been enough for the Smash scene for a long time. Some see the possibility of Nintendo becoming more heavily involved in the competitive community as a sort of holy grail that will lift them into the esports stratosphere alongside games like League of Legends and Dota 2, both of which enjoy substantial monetary and logistical support from their creators. But the drive to capture that kind of support has resulted in restrictive self-policing by some of the most prominent Smash advocates, from the preemptive sacrifice of Project M to heavy-handed bans on playing Melee with anything other than a GameCube controller. It’s high time someone starts seriously weighing these potential benefits with the steadily building pile of forfeitures before the community becomes lost in its own need for official acknowledgement.